The perfect texture cookies that are crispy on the outside and chewy on the inside! 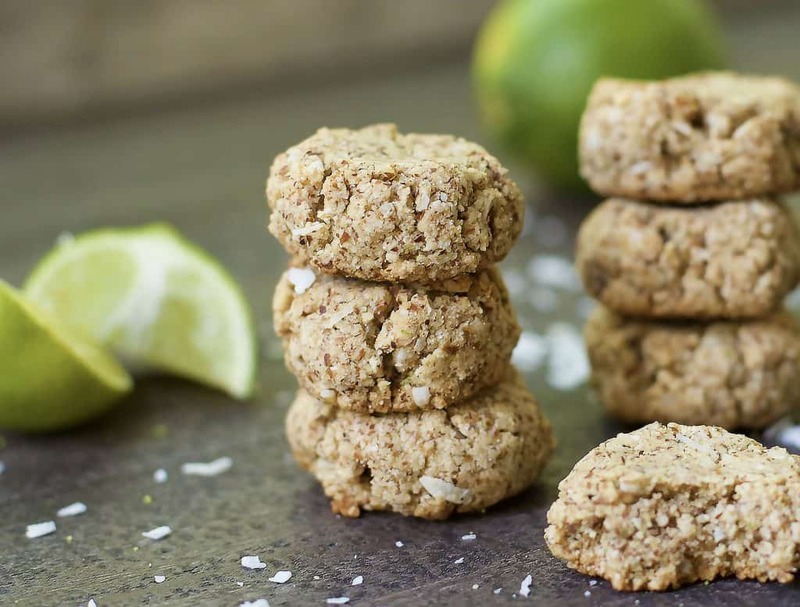 Infused with lime flavor and shredded coconut for a fun and delicious treat! Grain-free, Paleo, and Vegan. Sooooooo…. I’m noshing on these I type. Just a typical summer afternoon with heavy rain, my cuppa tea, and these perfect cookies. I am absolutely loving these. 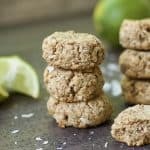 I created this recipe as a healthier variation to an original Coconut Lime Sugar Cookie recipe I got from my friend, Ali. Being the chocolate lover that I am, it is very rare that I find a dessert I can eat that doesn’t have chocolate. But these cookies. I am in LOVE!!!!!!! I’m not quite ready to forget my chocolate, but I definitely cheat on chocolate with these. And it’s worth every bite! They have this crunchy texture on the outside, then we have the buttery soft taste of the inside with some sweet lime flavor. 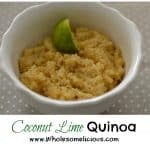 Add in the crispy coconut flakes, and it is like a party in your mouth! So good you guys. A little confession here….I actually decided to give up sweets for the month of June, just to get back on track. 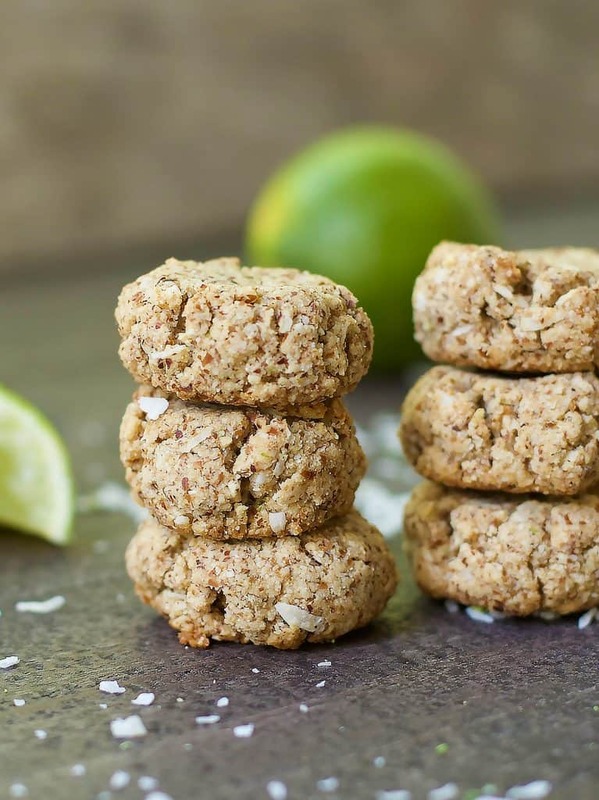 But after my daughter was asking me to make coconut lime cookies…….. I caved. Don’t judge!!! Grain-free, refined-sugar free, and low sugar. It’s totally fine right?!?! Don’t answer that, I will. I’m only eating one per day, and handing off the rest to my husband and kids. They love them too! So go on, and make your batch. Mix together coconut oil, lime juice, and maple syrup. Add wet ingredients to dry and mix with a large spoon until dry pockets disappear. Now spoon into small balls (approximately 1 tbsp) and spread over a cookie sheet. Gently press down with a spoon to flatten out cookies. Bake for approximately 12 minutes. Please note this will depend on how large you rolled your cookies. Mine were small, and took right around 12 minutes. They may need an extra 2 minutes. They should be firm to the touch, lightly golden, but still soft. Remove from oven. Let sit for another 5 minutes, then remove to a cooling rack to cool completely. 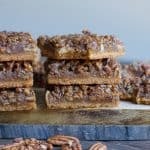 Total disclosure, while I’m munching on these amazing cookies, I have to leave a “Thank you Amy” for sharing this recipe. So, thank you Amy. My family has significant nut allergies. 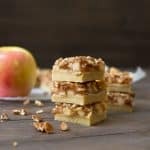 Can I sub coconut flour for almond flour? Or what do you recommend? 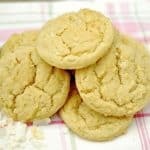 I wanted to make the coconut lime sugar cookies but needed to tweak it for my family. Coconut flour would make it to dry. Can you try cassava flour? 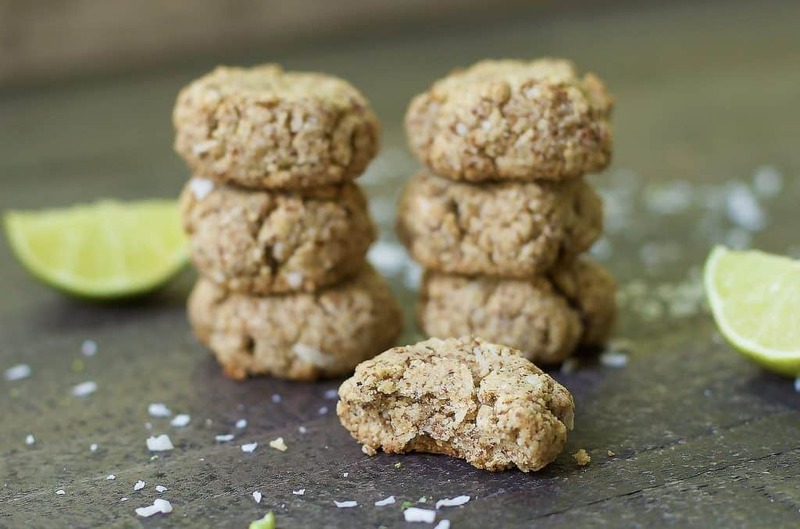 You might also want to add in a bit more coconut oil, the almond flour makes the cookies extra moist.